This is the candle magic book you’ve been missing. 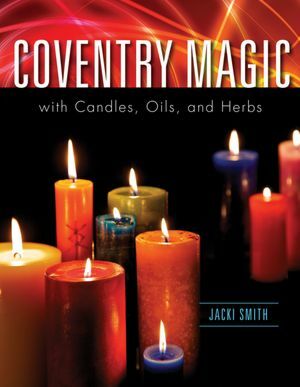 Jacki Smith, owner of Coventry Creations candles, shares the secrets of her magical and business success in this “fill in the blanks” style book on candle magic and tailoring spells. Not only is Coventry Magic in itself a great reference, it makes your other books on candle magic all the more usable by breaking a few “codes” sometimes not spelled out in books from publishers such as Anna Riva company. From exercises that help you stop blocking your own magic to a chart to determine what it means when a candle burns strangely, Smith answers many questions that might go unexplained on a Pagan message board. Smith writes in an accessible, likable tone that makes it easy to absorb what she has to teach. She also uses her own experiences as illustration. This is an excellent read for anyone interested in improving his or her magical practice, and the methods can go far beyond candle magic spells.